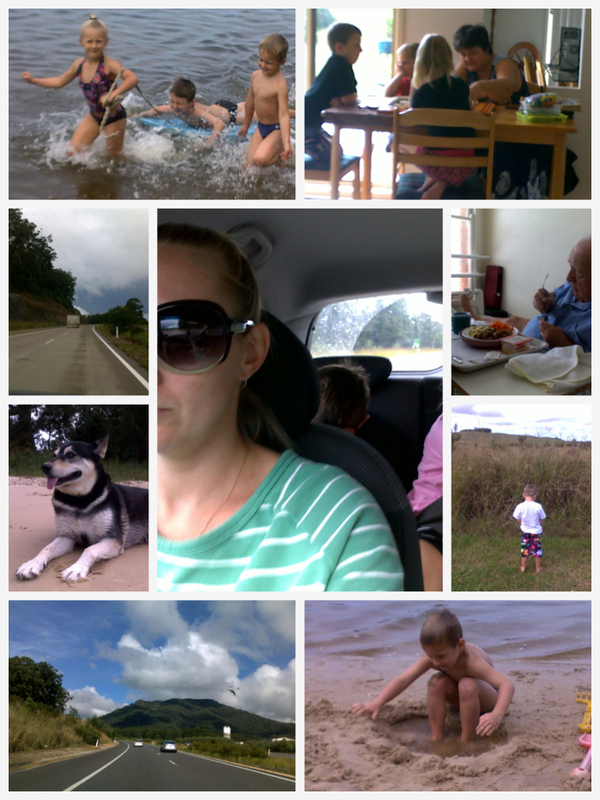 1 Adult, 1 Dog (my 4th baby), 3 Kids and 930km round trip of highway. and spending quality time with their Nanny and Boo Boo. We managed some time however breif it was in the sand and surf. To see Grandpa who is much better and moving about a little more each day. And let the Kids run around the farm, breathing in fresh air, streching there lungs an legs, and enjoying the freedom of space. It was Murphy's law that the best weather was as we headed home. I was quietly suprised that the traffic was quiet considering how close to the end of school holidays It was, I was expecting a lot of congestion and delays. I can not fault the kids on there travel performance, even if one more pit (pee) stop was going to reduce me to wimpering heap, but I'm blessed with 3 excellent travelllers, they have been well seasoned since they we're born, travelling from the N.T down to VIC every year, and I am glad to say they were just angels to travel with yet again. I'm not new to travelling long distances solo with 3 kids and a dog, but this has been my longest journey so far, and remarkably the easiest trip I've made. But I think this has to do more with the kids age then my experience. because I know from experience that it just doesnt happen like that, I've learn't the hard way, the kind that envolves, heartache, screaming mactches, and worst of all the sorrowful eyes of little children looking questionlying "but why". I learnt that If I didn't take the bull by the horn my kids would miss out and so would I, and whilst I know it sounds selfish leaving my husband at home alone fending for himself and slaving away at work while we're away on holidays having a blast, if he had time off we'd have him with us in a heart beat. Limitations are only restrictions we put on ourselves. I know there will be a lot more trip in the near distance future. I know I can do it, and nothing will stop me.